At our clinic in Tralee we offer a wide range of orthotics, both prefabricated and custom made . Full length prefabricated orthotics cost €70 per pair. These are a quality product and are generally better than you will find in shops. They are relatively inexpensive, have a reasonable lifespan (usually around 9 months to 1 year) and are sufficient in many cases where supportive insoles are required. Also they can easily be modified by us free of charge for the injury you present with. For a more accurately modified and better fitting insoles we measure, fit and custom design them for your feet . Prices for custom-made orthotics are generally around €300 including fitting and follow up. There are no extra charges. Both the price and the quality of the product are better than most of our competitors. In order to fit a patient with customised insoles, plaster of paris moulds of both feet are made. Gait analysis and biomechanical assessments are also taken. The castings along with the other measurements taken are then sent to a top production facility where the orthotics are manufactured under the supervision of qualified podiatrists. The insoles are usually available for collection at our clinic within two to three weeks. Tendinopathies of lower leg and foot. What is a prefabricated orthotic ? A prefabricated orthotic is basically a pre-made orthotic with stick on attachments and/or removable parts that can be removed to allow easy modification of the product for different conditions. This type of orthosis is relatively inexpensive and often does the job. Orthotics are biomechanical medical appliances that are used to correct your specific foot imbalance. What is a custom orthotic ? A custom orthotic is a device designed to align the foot and ankle into the most anatomically efficient position. They look like insoles, but that is where the similarities end. Custom orthotics are biomechanical medical appliances that are custom made to correct your specific foot imbalance. They are individually fabricated over a three dimensional model of your foot. Custom orthotics work on your feet much like glasses work on your eyes – they reduce stress and strain on your body by bringing your feet back into proper alignment. These insoles are specifically designed to restore the balance of pressure on your joints, muscles, tendons and ligaments etc., reducing the overload and alleviating pain over time in the affected areas. Most often custom orthotics will fit comfortably into your shoes. Occasionally, a slightly larger shoe might be required. What should my new custom orthotics feel like ? Because custom orthotics help to realign the foundation of your body and specifically how your feet are functioning, you many notice a number of new sensations. This is to be expected and is a sign that the orthotic is doing its job. Some people feel that they are riding a little high in their shoes, feel that they are rolling to the outside of their feet, or that they notice a bit of pressure under their arch. All of these are normal sensations and will fade away after a proper break in period. Langer recommends that newly dispensed custom orthotics only be worn for one hour the first day and then increasing wearing time an additional hour each day. By following these instructions, most patients are easily able to transition. What kind of shoe do I need for my custom orthotics ? 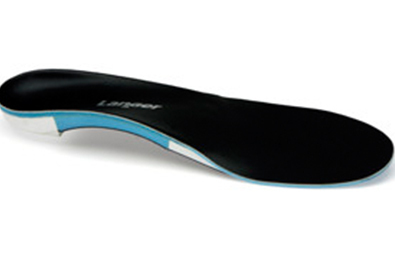 For the most part any shoe that has a removable insole will work with your custom orthotic. All you have to do is remove the insole that came with the shoe and replace it with the custom orthotic. Will my muscles get weaker from wearing orthotics ? Custom orthotics will not reduce muscles tone. They will help reposition your foot so that you will be using the right muscles at the right time, minimizing fatigue and allowing your muscles to be used more efficiently. Please note : We only prescribe orthotics where we feel they are necessary and are likely to be of benefit. Many injuries do not require orthotics and are just a result of overuse, or increasing training levels too quickly. These injuries usually just require a little rest and a little physio for recovery.